I could hardly be more shocked and stunned than I was earlier today, when I read the news of the sudden death of Dwayne McDuffie. If the name is unfamiliar to you, then I’ll assume that you’re not a fan of either comic books or animation, or if you are, you don’t pay much attention to the names in the credits of either. McDuffie was a prolific writer and editor of comics who became an equally prolific writer, story editor, and producer of animation, primarily for television. In the former realm, McDuffie created one of the most unique series in the history of comics: Damage Control, which spotlighted the exploits of a company that cleaned up cities after superhero fights. He also co-founded Milestone Media, an entire comics line that focused on bringing greater diversity to the medium, both on the page and behind the scenes. From Milestone’s publications came Static, the young electricity-wielding hero who later went on to star in the long-running and popular animated TV series, Static Shock. McDuffie’s contributions to animation didn’t end with Static Shock. He served as story editor and producer on the Justice League franchise, as well as on the various iterations of Ben 10. He recently wrote the script for Warner/DC’s latest direct-to-DVD project, All-Star Superman, which debuted in stores — ironically enough — today. As successful as he became in animation, McDuffie never completely abandoned printed comics. A few years ago, he wrote an outstanding miniseries for Marvel entitled Beyond!, and a well-regarded run on Fantastic Four. More recently, he breathed fresh life into DC’s tentpole series, Justice League of America. Unlike many creators, McDuffie maintained a close connection to the readers and viewers who consumed his product. His personal website hosted a thriving online discussion forum, in which McDuffie himself (nicknamed by his fans “The Maestro”) actively participated. Never shy of expressing his opinions — and he had strong opinions about everything — McDuffie in correspondence was much like the characters whose adventures he wrote: witty, thoughtful, and more than a little tough. He gave no quarter, but he had a deft way of disagreeing vehemently with opponents without resorting to ad hominem attacks. 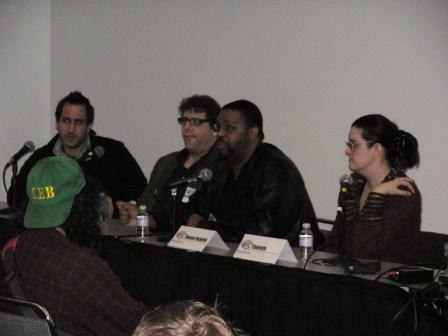 I had the privilege of meeting McDuffie briefly at WonderCon in 2008, following a panel featuring himself and several other top animation writers. (I took the above photo during that panel.) Although I didn’t muster the gumption to mention it to him in person, it was one of my career goals as a voice actor to snag a role in one of the series McDuffie wrote. As recently as a week ago, I’ve participated in workshops where McDuffie scripts served as the fodder for honing my acting chops. I deeply regret that I will never have the opportunity to work with him professionally. McDuffie spoke and wrote much about the uphill struggle of being an African-American creator in a mainstream comics industry often frustratingly closed to diverse talents and storylines. His founding of Milestone Media represented his best effort at giving other people of color the opportunities that he, like few other creators of his background, had been afforded, and expanding the palette of characters about whom great comics tales could be spun. And yet, McDuffie would have been the first to correct anyone who referred to him as a “great black comics writer” — he was just a darned great writer, period. A darned great writer, gone far too soon. Dwayne McDuffie leaves behind his wife, his mother, a monumental legacy of work, and a numberless legion of colleagues and fans who appreciated his character as much as his creative genius. He was a singular talent in two discrete media, and successful in both. He was just 49 years old — almost exactly two months younger than I. His birthday was yesterday. This entry was posted on February 22, 2011 at 9:44 pm and is filed under Celebritiana, Cinemania, Comic Art Friday, Dead People Got No Reason to Live, Getting Racial Up In This Piece, Hero of the Day, Ripped From the Headlines, Teleholics Anonymous. You can subscribe via RSS 2.0 feed to this post's comments. You can comment below, or link to this permanent URL from your own site. When I got home from work yesterday, I logged on and, as I usually do, checked my e-mail. My attention was immediately drawn to three e-mails, all arriving at about the same time, whose headers all gave the same grim news: Dwayne McDuffie had died. I sat there for a moment, stunned and hoping against hope that maybe it was some kind of lame internet hoax. But as I opened each one, it became apparent that the nightmare was reality. We had lost one of our greatest talents, a man whose contributions to the worlds of comics and animation was as impressive as it was vast. I think the first Dwayne McDuffie work I’d ever read was the first Damage Control limited series. I later enjoyed his work on the second Deathlok series where he, along with artist Denys Cowan, set the stage for what we could expect to see when Milestone made its debut years later. I remember receiving an issue of The Comics Buyers Guide (which I subscribed to at the time) and reading about the coming of Milestone. Gleeful and exuberant doesn’t even begin to describe my feelings at that moment. Icon and Hardware were my two favorite titles. I own every issue of both to this day. I also bought Static and Blood Syndicate, Xombi, Heroes, and Shadow Cabinet. It seemed as if the vision of a more diverse comics industry was at the beginning of being a reality. But alas, despite years of turning out great, groundbreaking comics, Milestone’s comics line eventually came to an end. I eagerly followed Dwayne’s animation endeavors. Static Shock was a Saturday morning favorite, and I consider Justice League Unlimited to be the best animated superhero series EVER. And when he made his way back to comics, I eagerly followed his tenure on the new Damage Control limited series and especially Justice League of America. Unfortunately, his run on Justice League ended prematurely — and similarly, his time with us has ended far too soon. But his work and his influence will live on forever. Damon: Well said, mi amigo. I can’t add anything to that. Thank you for sharing your thoughts.